Jul. 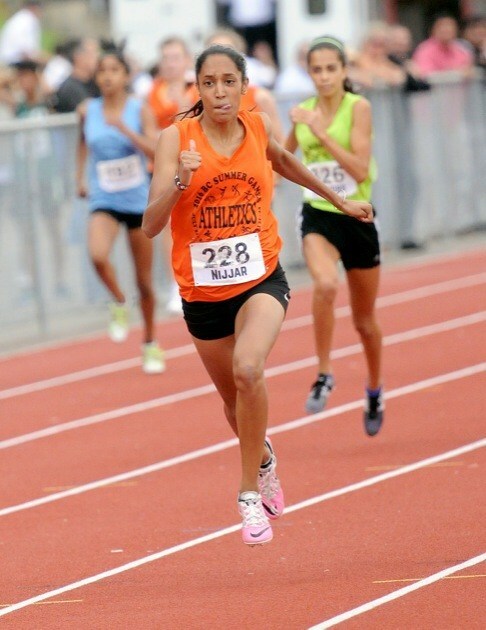 23, 2016 7:00 a.m.
A dominant performance from start to finish earned Surrey's Jasneet Nijjar a gold medal in the women's 300 metre race. Jasneet Nijjar looked like she was shot out of a cannon at the start of the women’s 300 metre race, and she only got faster cruising to an easy win. The Surrey native blazed through the finish line in 39.36 seconds, a full second and a half ahead of runner up Angelina Shandro (Victoria). Nijjar said she was tired from the preliminary race held earlier in the day, but you wouldn’t have known it. You wouldn’t have suspected she was feeling nervous either. Langley’s Brooke Mussche grabbed bronze.